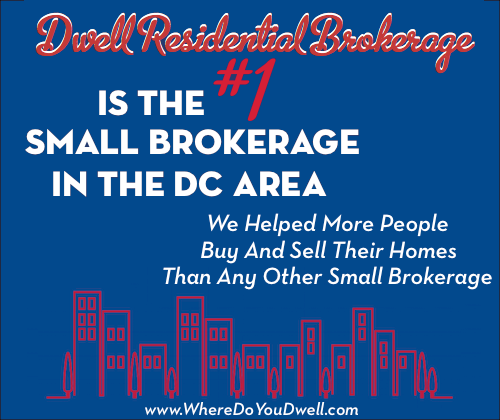 What’s the Average Home Price in the DC Area? The housing market for the DC metro area was off to a good start in January 2015, with recent year-over-year statistics showing increases in sales, prices, new contracts and inventories. January is usually a slow time of year for real estate with less activity than in December, but compared to other years it’s stronger, with new contracts at its highest January level since 2011. All categories – single-family detached homes, townhomes, and condos – showed increases in pending sales and inventory, according to data comprised by RealEstate Business Intelligence. This positive movement should continue into the spring buying season, drawing both buyers and sellers into the market. Good news for the coming year – lots of “increases” and “highest levels” in this recent January data! There were a total of 2,554 closed sales, the highest for the month of January since 2010. It’s also the first time since October 2013 that there have been two consecutive year-over-year increases. Single-family homes sales increased 5.2%, townhomes increased 4.2%, and condos increased 3.6% compared to last January. It was the third consecutive January that showed an increase in new contracts, and it was the highest contract activity this time of year in four years. The number of new contracts was 3,720, indicating a year-over-year bump of 6.2%. Townhomes had the highest increase with 9.8%, single-family detached homes increased 8.5%, and condos declined slightly by less than 1%. This January saw sales prices rise year-over-year, with condos showing the highest increase. The median sales price in the DC metro area was $385,000, the highest January level since 2007, with condos and townhomes contributing to this increase. Single-family detached homes were at their highest January level since 2008, at $450,000. 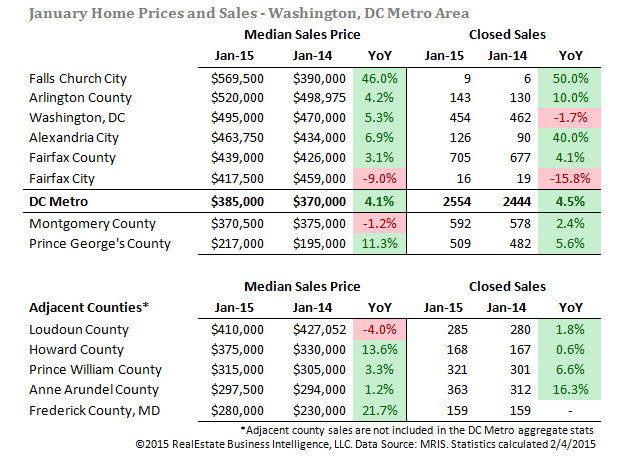 All jurisdictions in the area showed increases in median sales prices except for Fairfax City and Montgomery County. Active listings continued to rise from the prior year, with 16 consecutive months of increases. There were 7,949 active listings, an 18% increase from last January. It’s the first time that inventory for all housing categories increased for more than a 12 month period since 2007. New listings increased 4.4% from January 2014. Condos saw its first rise in new listings in four months. The median DOM increased by 13 days, for a total of 45 days. It is eight days lower than the 10-year average of 53 days, and the highest in any month since February 2012. All this means the DC Area market is strong and gaining steam this year. We are likely to see more record highs as more people move to the area for high paying jobs and can afford the homes here. This type of market is great for both buyers and sellers, although slightly favors sellers.